by Renuka Sane and Rajeswari Sengupta. The Insolvency and Bankruptcy Code (IBC) was enacted in 2016. At the time, there were a large number of zombie firms in the Indian landscape, where the first default had taken place a while ago. This motivates a question: Does the IBC perform differently when confronted with a recent default, compared with the outcomes obtained when dealing with legacy problems? In what form does the difference manifest itself? Our prior is that old cases would fare worse, for two reasons. First, there is a selection bias. The defaulting firms who were relatively stronger, are more likely to have found a solution through successful private negotiations. The survivors are likely to be the zombie firms who would be in bad shape. Second, a firm that defaults is a melting ice cube. Every day, value is destroyed. The very fact that the default in these old cases took place a while ago suggests that substantial value destruction may have taken place. In a sound bankruptcy process, the firm is brought to the insolvency resolution process rapidly, which increases the chances of rescuing a viable business under a new ownership and balance sheet. These old cases did not have access to a sound bankruptcy process, until now. If such a phenomenon is at work, the unconditional performance of the IBC (example, example, example) will tend to be understated. The correct measure of how well the IBC works should then be seen by restricting the analysis to recent defaults only. In this article, we show some early small sample evidence, where IBC outcomes of old and new defaults are compared. We look at two metrics: the final outcome (liquidation or resolution), and in the class of firms that did go through a resolution, the time taken and the recovery rate. We find that a larger proportion of the old, legacy cases were liquidated. Median recovery rates were lower for the old cases that did go through a resolution compared to the more recent cases. However, there was no difference in time taken to complete the IRP process. We do not have access to the date of default. This information is not disclosed by either the National Company Law Tribunal (NCLT) or the Insolvency and Bankruptcy Board of India (IBBI). We identify old cases as those where resolution began under the Sick Industrial Companies Act, 1985 (SICA) and have remained pending at the Board for Industrial and Financial Reconstruction (BIFR). With the repeal of SICA, the Eighth Schedule of IBC explicitly provides for the abatement of the existing SICA cases pending at BIFR and Appellate Authority for Industrial and Financial Reconstruction (AAIFR), with an option to re-initiate them as new cases under IBC. We use two sources of data. The first comes from the IGIDR Finance Research Group's (FRG) database on bankruptcy. The dataset contains all unique debtor firms from January 1, 2017 till December 31, 2018. This provides us a macro picture on the number of liquidations and resolutions of BIFR and non-BIFR firms. The data on resolutions is sourced from the IBBI which has obtained the information from resolution professionals. In this databse we see 82 firms where resolution plans have been approved by the NCLT as of December 31, 2018. This is the most recent data available as of now. We remove the outliers from our sample, where the realisation amount exceeds the total amount of claims filed. This gives us a dataset with 72 cases. An interesting feature of this data is that the BIFR cases are smaller, with a mean liquidation value of Rs.1.75 billion, as compared with the mean liquidation value of Rs.6.25 billion for the non-BIFR firms. Q1: Do we see more liquidations of BIFR firms? According to the FRG database, there were 1000 ongoing cases of bankruptcy. 304 firms had been liquidated while 79 had undergone resolution. Table 1 provides a break-up of BIFR and non-BIFR firms depending on their resolution status. This suggests that most of the firms that had been in BIFR and that came to IBC, went into liquidation. This is not surprising as substantial value destruction would have taken place just by being in the process for many years, and it is highly unlikely that these firms had any value as a going concern. Using the information from the IBBI dataset, we calculate the average recovery rates and the average time taken for the legacy (BIFR) and recent (non-BIFR) cases, as shown in Table 2. The recovery rate is estimated as the ratio of the realisable amount and admitted claims of the respective classes of creditors (FCs and OCs). This is not calculated on a net present value (NPV) basis and hence needs to be interpreted accordingly. We do not have access to information on realisable amount on an NPV basis. The main feature of these results is that the sample means and the medians of the two groups are rather alike on a number of parameters. The average and median time taken to resolution is the same for the two groups. The mean recovery rate is around 47% for both groups. There is, however, almost a 10 percentage point difference in the median recovery rate - once again not surprising given that BIFR firms are likely to have seen significant value destruction before they came to the IBC. The same pattern is repeated when one looks at recovery rates of financial and operational creditors between the two groups of firms. Our prior was that the legacy cases have been festering for long and hence have experienced prolonged value depreciation, and would therefore see different outcomes than fresh defaults. We find the difference in the form of more liquidations of the legacy firms, and significant differences in liquidation value, and median recovery rates. We, however, do not find any difference in the time taken to complete the insolvency resolution process. This could be because the legacy cases which were in worse shape went into liquidation and those that remained in IRP were not very different in nature compared to the recent defaults. This also motivates thoughts for further research. Will this result hold up with stronger datasets that maybe visible in a year or two? This kind of analysis, conducted on a bigger dataset spanning a few years post IBC, is likely to give a more realistic picture of the performance of IBC as opposed to analyses which view the legacy and recent cases from the same perspective. The authors are researchers at NIPFP and IGIDR respectively. by Karan Gulati, Shubho Roy, Renuka Sane. In late 2017, the government introduced the Financial Resolution and Deposit Insurance (FRDI) Bill which proposed a new resolution framework for banks and financial firms. It planned an overhaul of the present system operated jointly by the Reserve Bank of India (RBI) and the Deposit Insurance and Credit Guarantee Corporation (DICGC), and introduce a modern Resolution Corporation with more extensive powers to regulate and resolve banks. The bill faced resistance in Parliament. The opposition stated that the bill risked the solvency of public sector banks and accused the government of putting public money at risk. Some argued that the current system of deposit insurance would be taken away by the proposed FRDI law. The Bill was said to have been “designed to punish small depositors for the sins of defaulters, corrupt bank managers and political masterminds”. The bill was withdrawn in 2018. As a result, the DICGC has remained the insurer for bank deposits. In this article, we attempt to measure how the DICGC has fared in processing bank failures and settling claims of depositors. Today, the DICGC acts as a pay-box. Under its eponymous law of 1961, the DICGC insures the deposits of banks created by parliamentary (central) legislation, private banks, and eligible co-operative banks. Eligible co-operative banks are a subset of co-operative banks where the state legislature has empowered the RBI to exercise some regulatory oversight. Under the 1961 Act, if a bank insured by DICGC is wound up or has its license cancelled by the RBI, every depositor is entitled to insurance of up to Rupees 100,000. The law envisages a quick payout to reduce inconvenience to depositors due to a bank failure. Within three months of being appointed, every liquidator of a bank must provide to DICGC, a list of depositors with the amount due to each one of them (S.17(1)). The DICGC, then makes the insurance payout. The law (S. 17 (2)) requires DICGC to pay claims within two months of receiving the list from the liquidator. We source data from annual reports of the DICGC and RBI notifications concerning the cancellation of license/ de-registration of 127 banks from 2013 to 2018. From these, we note the year of payout under the DICGC Act, number of depositors, and the amount of claims settled. We were able to trace RBI notifications for 115 banks, which accounted for 95% of all depositors, and 99% of the amount of payouts. We measure the time taken between the RBI notification (which we assume to be analogous with the exit of the bank), the disbursement of the payments; and the opportunity cost of the amount of claims at 8% and 20% per annum. The hand-collected data set is accessible here. Bank failures are especially disruptive for depositors. Banks work on the promise of providing deposits callable at par. A bank makes a promise to allow the depositor to withdraw their money within one banking day. This gives confidence to the depositor to use banks for their daily needs rather than hoarding cash. Though there have been no commercial bank failures in India in the recent past, this hides a deep and persistent problem of co-operative bank failures in India. As the table above shows, over the last five years, 25 co-operative banks have received payouts by DICGC each year on an average. More than 400,000 depositors had to use the deposit insurance scheme. These are not small numbers. Their experience of the deposit insurance payout will be the basis of the trust they will repose in the banking system, the regulator, and the deposit insurance scheme. Under the DICGC Act, the liquidator is supposed to provide a list of claimants to DICGC within three months of her appointment. However, a major cause of delay for the payouts is that the claims list is not received from the liquidator within the stipulated time limit. This may be because cases filed against the liquidator are in court, appeals by the bank are pending before the Ministry of Finance (Appellate Authority), or clarifications are required about the claims list. The process of disbursement of payments needs to be expedient so that depositors do not suffer undue losses and maximum value is derived from the failed institution. 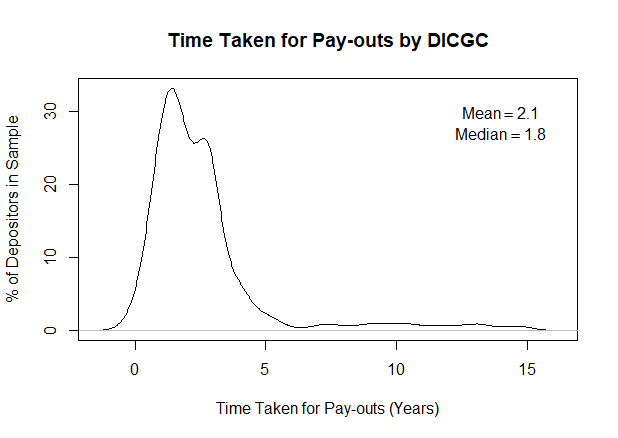 To measure the effectiveness of DICGC we calculate the opportunity cost of the delay in payments. Money today is worth more than money tomorrow. Since the depositors are unable to access their money, which was promised to be to be callable at par, they face a loss. Depositors have three choices (i) find an alternate source/borrow, (ii) forgo consumption or, (iii) forgo investment. The time taken by DICGC for the disbursement of the due amount imposes a cost on the depositors. The standard measure for delayed payment is the opportunity cost of the money. It is calculated by discounting the amount with a discount rate over the time by which it was delayed. For example, if the depositor is owed Rs. 100; and the insurance payout delay is 1 year; and the discount rate is 10%, then a payout of Rs. 100 at the end of the year is effectively a payout of only Rs. 91. If the payout is delayed by 2 years; effective payout is Rs. 82.64. We use two rates of discounting to measure the opportunity cost: 8% and 20%. 8% is slightly above the risk-free rate of return and can be considered as the minimum opportunity cost of money. However, if you are poor or an individual, it is almost impossible to borrow at this rate. So we choose another realistic rate of 20%. This is the rate at which the government requires buyers to compensate MSMEs for delayed payments (S. 16, MSMED Act). As the graph above shows, it took an average of 2.10 years for the disbursement of the amount by DICGC. This is five times the statutory limit of five months. Similarly, the median time taken is more than four times the statutory limit. The pay-out process took over 5 years in almost 1/3rd of the cases of failures. A reading of the Annual Reports of DICGC shows that in two cases of bank failure, it took over 14 years for the insurance claims to be disbursed. As of 20th March 2019, there were another 25 bank failures pending before DICGC, where depositors have been waiting for an average of 6.57 years. Two of these banks were de-registered 20 years ago and DICGC is yet to receive the claims list from the liquidator. As Table 2 shows, opportunity costs have risen over the years. At a conservative discount rate of 8%, depositors in 2017-18 effectively got only Rs. 322.56 million, for claims of Rs. 435.2 million, a 26% loss. This is due to the increasing delays in processing payouts. In 2013-14, the loss rate was only 10% of the value of insurance. However, 8% is an optimistic rate. At a realistic rate of 20%, depositors lost more than 50% of the value of payouts in 2017-18. At the realistic rate, depositors have lost over one third the value of their insurance in the past five years due to delays. One of the reasons for the delay is due to the fact that that DICGC itself does not have the power to obtain the list of depositors in a bank. It has to depend on the liquidator to provide the list. This explains a significant portion of the delays. As shown here, in a number of cases the DICGC is waiting for the liquidator to provide the list of insurance claimants. Allowing the Resolution Corporation to take over the management of a bank at risk before it stops banking activities and is bankrupt. Combining the function of the liquidator/receiver and insurer in the same agency. The Bill proposed a mechanism for an early warning system for banks at risk of failure. Banks would be classified into five categories ranging from low to critical. If a bank was classified in higher risk categories it would have to formulate its resolution plan which would include information about depositors [S.44]. The bill also allowed the Resolution Corporation to take over the management of banks at critical risk (S. 46) which is before bankruptcy (unlike the present system). This would give the Resolution Corporation the power to get into the books of the bank before it failed and consequently give it more time to make a list of insurance claimants without delay to depositors. This is unlike the present system where the DICGC enters the process only after the bank has been declared insolvent by the RBI and is unable to pay its dues (see here, here and here). By coming in before a bank has failed, the Resolution Corporation would have the ability to analyse its operational statements, books of records, and list of depositors entitled to payouts in the event of such a failure. Another cause of the delay is that the liquidator and DICGC are independent of each other. The liquidator is appointed after a Bank has been ordered to be wound up, and is not part of the DICGC. The DICGC hence has no authority in preparing the list of eligible claimants and has to depend on the liquidator to provide it. In contrast, the proposed Resolution Corporation would have acted as the liquidator and insurer for a co-operative bank in the event of a failure (S. 62). As such, the corporation would not have to depend on an external party to prepare a list of claimants. The process under the current regime is slow. It takes close to two years after the cancellation of license for the disbursement of claims. Since most co-operative banks service poorer clients, their failure hurts people who are not in a position to forgo their deposits for long periods of time. Today, without a framework for bankruptcy and orderly resolution for financial firms, India faces the risk that if a large private sector bank goes bankrupt, the depositors could be stuck for years before getting their money back. The focus of the deposit insurance corporation needs to shift from payouts after default, into the problem of identifying weak banks and stopping them. Many countries have developed specialised resolution regimes for various categories of financial firms. The Financial Stability Board recommends operational independence as a key attribute of resolution regimes. In several jurisdictions, including the USA, Canada, Malaysia, Mexico, Japan, Korea, etc., these are in the form of separate institutions with resolution powers. A welcome retreat: withdrawing the FRDI Bill, The Hindu, 10th August 2018. FRDI Bill: Panacea for banking sector set for quiet burial after PNB scam?, Business Standard, Archis Mohan, 22nd February 2018. Movement on the law for the Resolution Corporation, by Suyash Rai in The Leap Blog. Raghuram Rajan and Ajay Shah. New directions in Indian financial sector policy. In Priya Basu, editor, India’s financial sector: Recent reforms, future challenges, chapter 4, pages 54–87. Macmillan, 2005. The demise of Rupee Cooperative Bank: A malady, by Radhika Pandey and Sumathi Chandrashekaran in The Leap Blog. The Financial Resolution and Deposit Insurance Bill 2016, Department of Economic Affairs. Won’t let Centre pass FRDI Bill in Parliament: Abhishek Banerjee, The Indian Express, Express News Service, 26th December 2017. Shubho Roy and Renuka Sane are researchers at the National Institute of Public Finance and Policy and Karan Gulati is a law student at Symbiosis Law School, Noida.